2006 In 2006, the President signed a decree on the "Strategic Plan for Sustainable Development of Astana until 2030"
The President of Kazakhstan N.Nazarbayev signed decree № 67 from March 17, 2006, “About Strategic plan of sustainable development of Astana until 2030”. 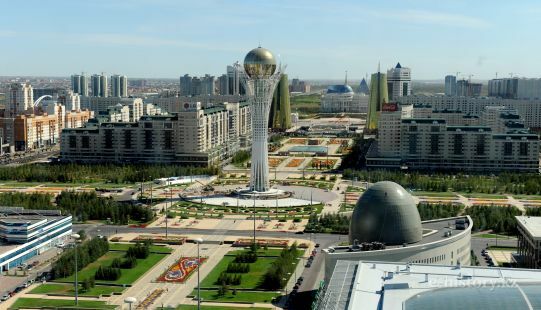 In 2006, the President signed a decree on the "Strategic Plan for Sustainable Development of Astana until 2030"
First paragraph of decree is Strategic plan of sustainable development of Astana until 2030. The government of Kazakhstan in a month period had to develop and approve action plan for implementation of Strategic plan. Central and local executive bodies, as well as government agencies, which are directly subordinated and accountable to the President of the Republic of Kazakhstan, in accordance with the Decree should be taken actions to implement the Strategic Plan. Akim (head of local government) of Astana entrusted in prescribed legislation of the Republic of Kazakhstan to coordinate implementation of the Strategic plan, semiannually no later than 25th of the month following the reporting period, provide implementation progress to the administration and the government of the President of Kazakhstan. Control over the implementation of this Decree is assigned to the President's Administration.